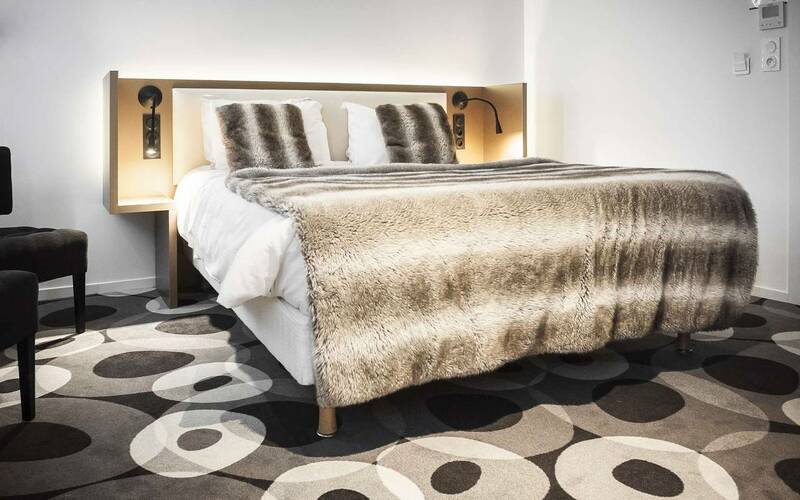 Measuring approximately 17 m², these "Privilege" rooms designed for two offer you space, comfort and relaxation. 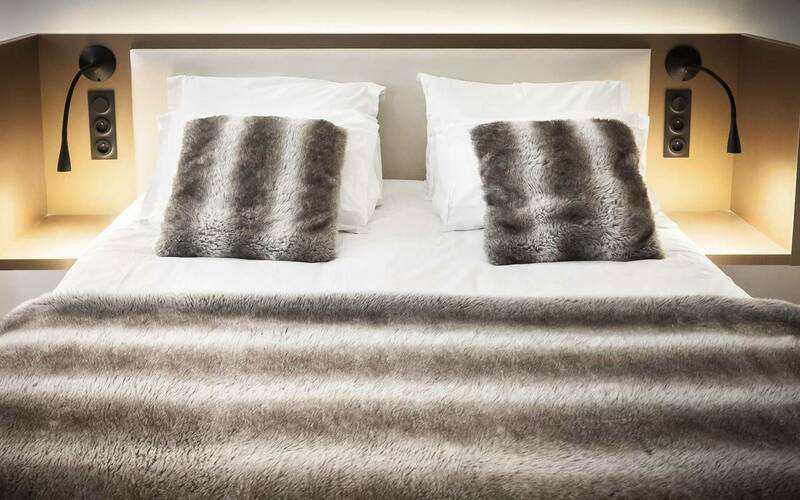 These five rooms are equipped with a 160 x 200 cm bed and promise you a peaceful night. To make the most of your stay, don't hesitate to specify when booking that you would like a balneotherapy bath. 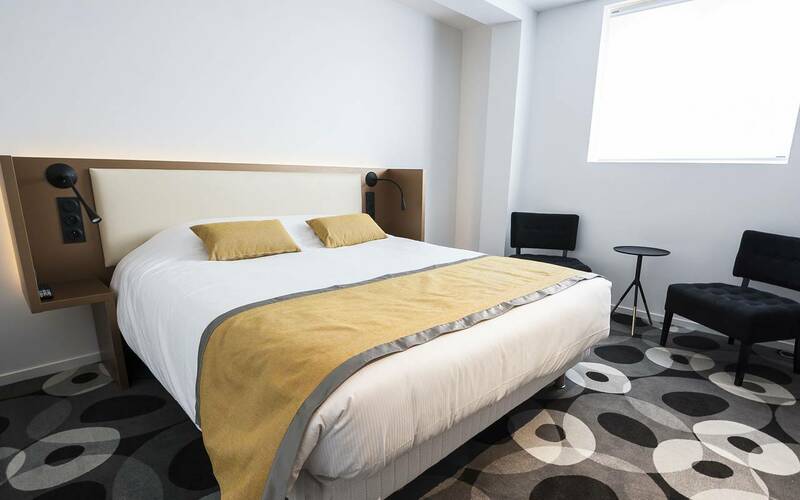 The "Privilege" Room is an air-conditioned room measuring approximately 17 m² designed for two with the comfort of a 160 x 200 cm double bed with Simmons suite 712 4-star bedding and a Jacuzzi balneotherapy bath (except for room 218, which has a shower). Enjoy the intimacy of a refined setting with contemporary decor. Discover the benefits provided by balneotherapy and light therapy. Recharge your batteries and add a romantic interlude to your stay. Balneotherapy is extremely relaxing, relieving painful muscles and encouraging a good night's sleep! Complimentary toiletries, such as a spa therapy milk with essential oils, are provided to enhance the experience. 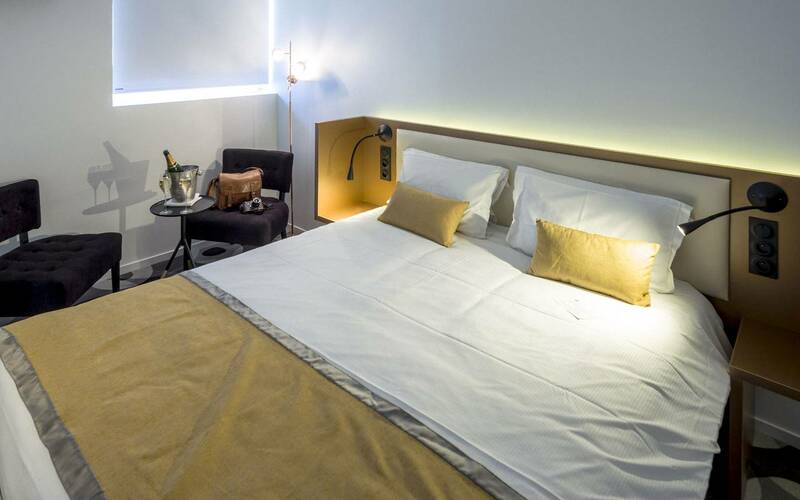 The room offers every comfort: air conditioning, flat-screen television with international channels, personal safe, free WiFi, hairdryer and toiletries. 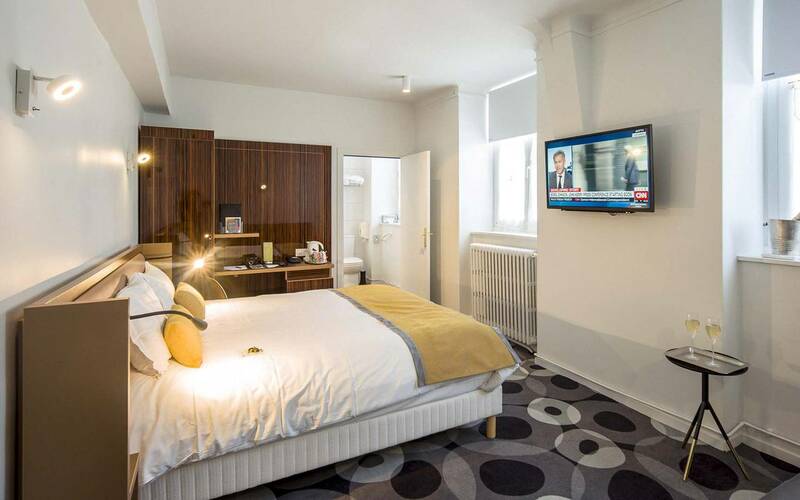 Come and discover the new Hôtel Bulles concept. Enjoy our best rate guaranteed by booking your room on our official website. Measuring around 20 m², these "Vintage" rooms designed for two welcome you for a pleasant and peaceful night. 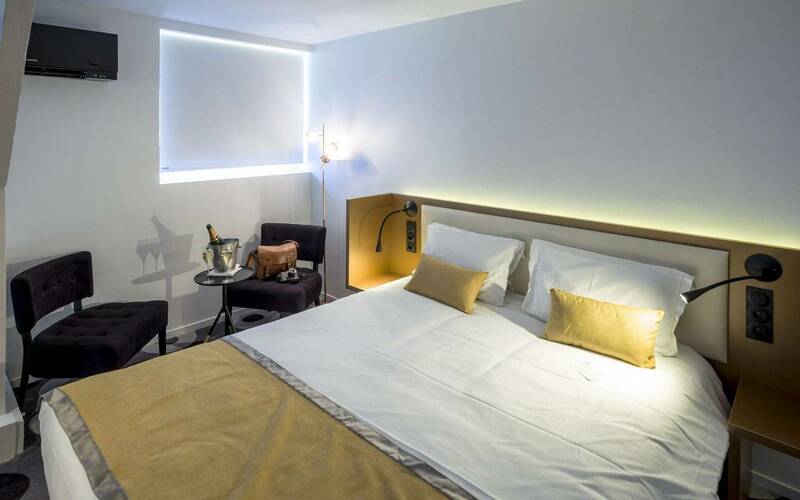 These three rooms are equipped with a 160 x 200 cm bed and promise you the perfect stay. For an exceptional stay, don't hesitate to specify when booking that you would like a Jacuzzi balneotherapy bath. 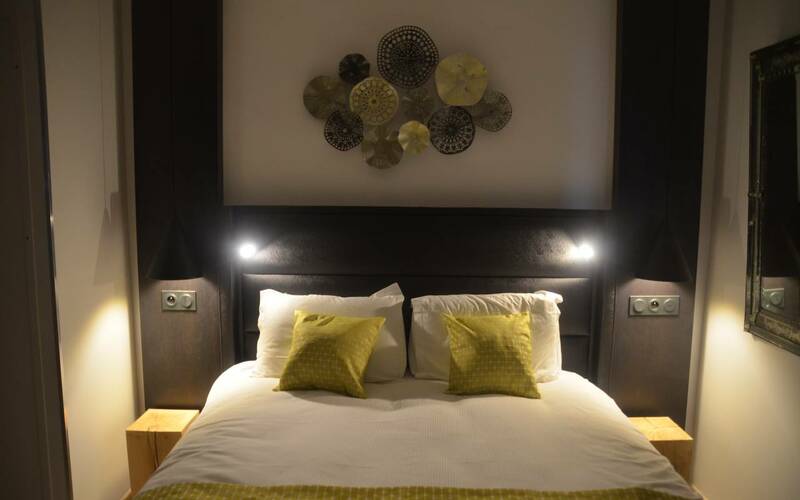 A large double room measuring approximately 20 m² with a balneotherapy bath and a little lounge to spend a pleasant time together in peace and quiet. Enjoy our chic and contemporary interior design. Slip on your bathrobe and dive into the Jacuzzi-style balneotherapy bath for a carefree, relaxed stay. 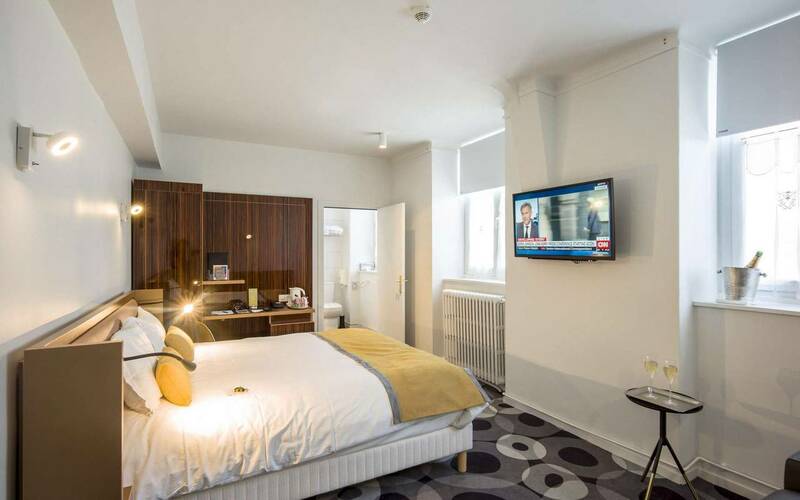 The Vintage room promises you a peaceful night with all the comforts you need: flat-screen television, numerous international channels, free WiFi, safe, hairdryer, toiletries, and Simmons Suite 712 4-star bedding. 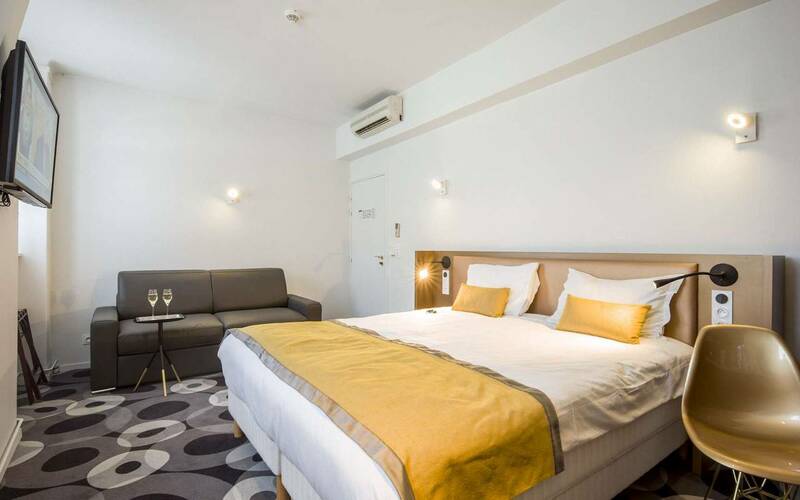 The "Vintage" Room is an air-conditioned room that welcomes you with the comfort of a 160 x 200 cm double bed worthy of the finest establishments (Simmons suite 712). Looking to bring a sparkle to your stay? For lovers of fine fizz, you can order your favourite champagne. The establishment offers you a wide choice of our finest bottles. It will be our pleasure to bring it to your room. On appointment with our partner, you can enjoy a massage in your room. The Hôtel Bulles awaits you. Ranging between 21 and 28 m², these "Vintage Year" suites designed for two or four people offer you a high level of comfort worthy of our finest suites. 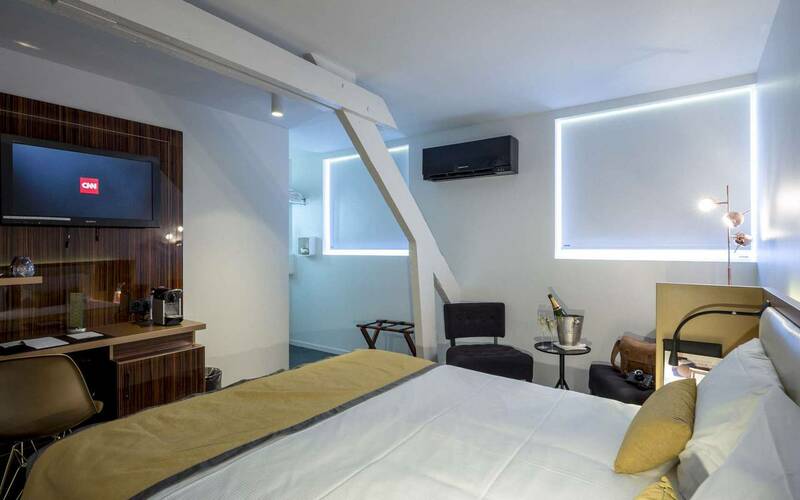 These four rooms have a 160 x 200 cm bed (except for 102 with 90 x 200 cm twin beds) and a convertible bed. For an unforgettable stay, don't hesitate to specify when booking that you would like a balneotherapy bath. 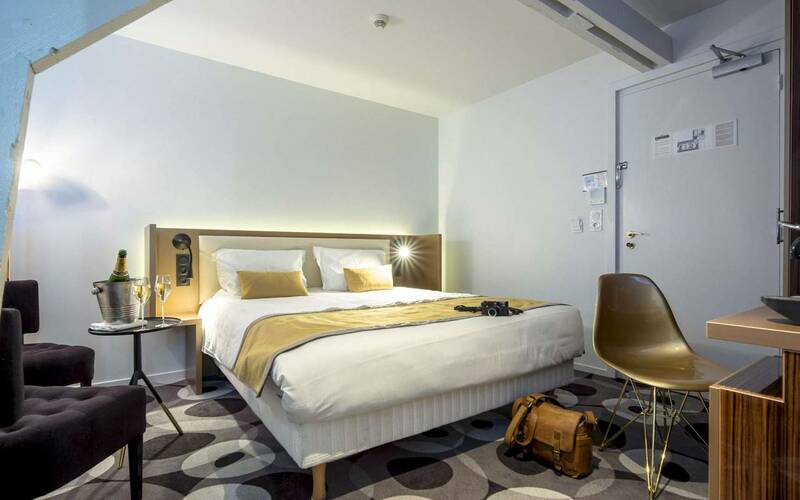 The "Vintage Year" Junior Suite is an air-conditioned room that welcomes you with the comfort of a large optimised space of approximately 25 m² in a modern, streamlined style. We have a room with access for people with reduced mobility – PRM. (Room 102). 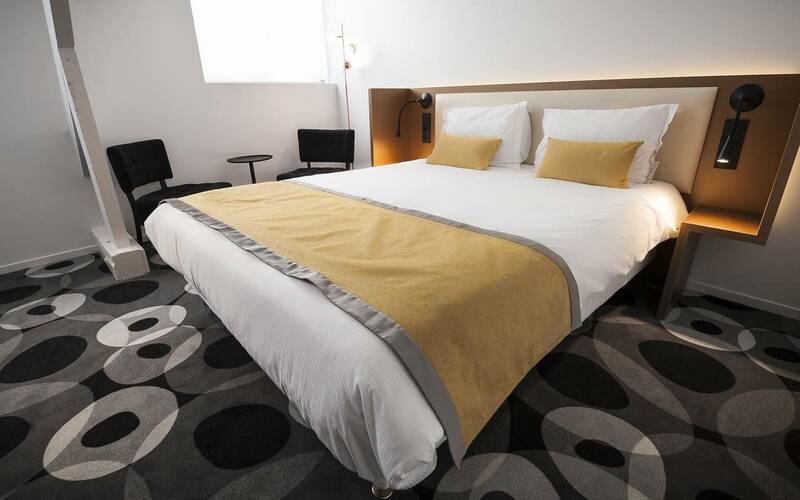 We have chosen 4-star quality (Simmons suite 712) bedding for you with a 160 x 200 cm double bed. The most high-end room you can book with us! Each one has a convertible bed, allowing it to accommodate four people for friendly evenings spent together. 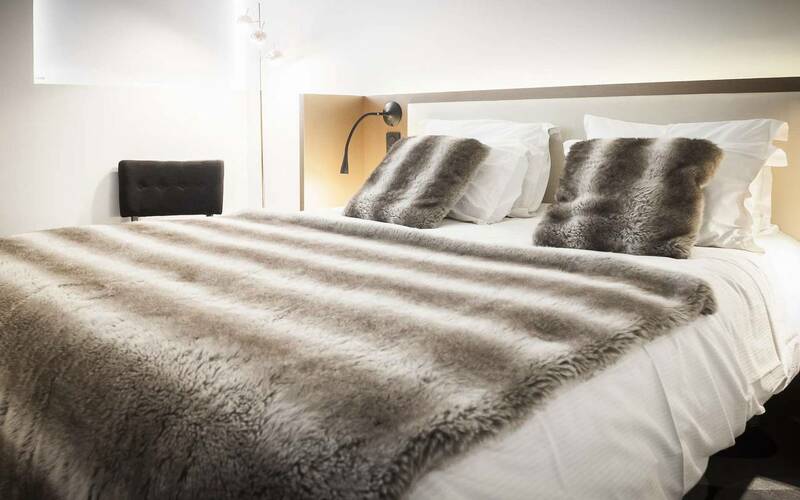 This real haven of well-being will offer you a discreetly luxurious, contemporary setting. Spacious and luminous, the room boasts comfortable sofas for relaxing and reading. You will find every convenience: Flat-screen television, international channels, air conditioning, hairdryer, free WiFi and a personal safe. Discover our menu of champagnes by the glass in the lounge of your junior suite. To make the most of your stay, don't hesitate to specify when booking that you would like a balneotherapy bath. On appointment with our partner, you can enjoy a massage in your room alone or as a couple. "A beautiful hotel that is good value for money. Nice, welcoming staff. I recommend it for a family holiday or a business trip." "We chose the chef's set lunch menu, the value for money is unbeatable, a cocktail prepared before our eyes, fine dishes, etc." "Very good molecular gastronomy. Created by a renowned chef. Not to be missed. Very good service. More expensive but top quality." Directly contact our qualified partner to book your treatments. The treatments are given in your room (only in vintage rooms and junior suites).